World Recruiters is a premier retained search firm specializing in placing technical and high level executives worldwide. We are global executive recruiters in the filtration industry , This International Retained Search Firm and Executive Pharmaceutical Biotech Recruiting Firm has diverse clientele ranges from Fortune 500 companies to IPO's to unique technological firms. 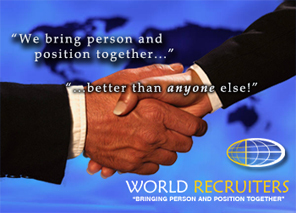 We at World Recruiters can tailor our services to fit your needs in virtually any industry specialization. See what this International Retained Search Firm has to offer. The #1 Filtration and Separation Recruiting Firm in the World!